Whenever a person goes for a job interview whether it is their first or not how they present themselves is very important at these interviews. And one of the most important factors is the body language of the individual at all times. The way they represent themselves before the interviewer is very important as this would be the first impression of themselves on the interviewer and they need to ensure that it happens properly. For the case of a person going for an interview which isn’t their first, they might already know what their body language needs to be. So they need to ensure that for their next job interview their body language should be much better in comparison to their previous interview and for that they need to follow some of the tips mentioned below. The person should know to carry good body posture for the next interview and not have a bad posture during any time of the interview. Always a person who behaves in a lazy way during the interview will lean back and lean forward and slouch at most times. So instead of a person starting to do that, they must rather opt for just staying calm and taking a comfortable posture so that they also aren’t so bothered by it. During any interview, maintaining the eye contact on the interviewer at all times is very essential. The person should not feel uncomfortable in maintaining eye contact with the interviewer as it is natural but should do it, so that the interviewer doesn’t think that the person isn’t so interested for the job. Even the person must not stare for a long time but maintain eye contact for a suitable amount of time. The basic manners that a person needs to know is that when their interview is being conducted there is a much senior and experienced person taking the interview and so it is expected that the person does not point at all towards the interviewer. If this happens the interviewer may think that the person is acting in an aggressive way and may not consider for the job as the person taking the interview may think that the person is acting over smart. Whenever a person interviewing for a job sits and folds or crosses their arms, it shows a sign that the person isn’t really interested in what is going on which will be the first thought of the person taking the interview. So the person should not fold their arms and sit but rather keep them at their side so that the interviewer knows that they are acting in a much approachable way and are interested in the job also. Nodding of the head at times happens unknowingly for the person when the interview is going on and it may have even happened in a previous interview. So the person should know that this happens to them at times and should be much aware at the time for a second interview and should know that any unnecessary nodding of the head isn’t really needed. Maybe just nodding once or twice by smiling at the interviewer whenever necessary would be fine. Fidgeting also known as getting distracted by yourself is very common for any person to happen no matter how many interviews they have been to. It is a very bad habit to fidget at the time of an interview so the person should just stop it and see that it doesn’t happen during the interview. Just know that the more the person fidgets during an interview, the more the interviewer starts having a bad impression on the person. During any interview the interviewer gets a first look on the personality when the person walks inside the room. So when the person enters the room or is standing in the room they should keep their hands behind their back at all times so that they don’t have any opportunity to fidget for any unnecessary reason. Even a person can keep their hands inside their pockets but though they might not be so distracted it isn’t a professional way of presentation and so it should be avoided. At times during an interview no matter which interview it is, a time may arise when the tone of the person may not match the facial expressions which in turn the interviewer starts thinking that the person has an arrogant attitude within them. So the person must ensure not to make the same mistake again if they have done it in a previous interview and be a calm person who is able to explain things whenever asked. When the interview is being conducted it is a really bad thing for a person to keep shifting their eyes looking at different directions and different things inside the room. This shows that the person is very distracted and isn’t so confident which leads to them thinking that they are lying to some extent. So if such a thing has happened before in an interview the person must ensure that they don’t continue to act in the same manner again at a different interview. Confidence is one of the most important thing that a person needs to have within them before and when the interview is being conducted. At times the person may not have got a job previously due to a lack of confidence within them. So the person must know that this time being a new place they must stay confident when they are in front of the interviewer in order to improve their chances of getting a job now. 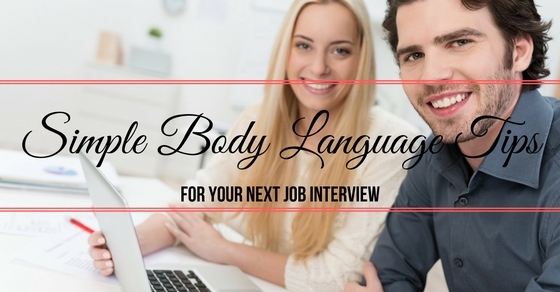 The person should know that they have an experience of being for an interview in the past and should know that where they have gone when it comes to showing the wrong body language. The first interview even if they have not got the job should be taken as a learning experience and the person now should know that in their previous interview they have shown some negative body language which wasn’t necessary and should know that they shouldn’t repeat it once again. Though things may not have worked well in the previous job interview, this time around the person must look forward towards laying a good and a positive impression. This time, the person should be the first one under consideration for the job before every other candidates, as even the employer would like to have such a person working for them who shows so much positivity in the workplace. Staying focused during an interview is very difficult for a person to do but losing focus is very easy. So only when a person stays focused enough during the interview it improves their chances of getting the job. So in this interview they need to maintain strong focus between them and the person taking the interview and see that it happens in a better and a positive way in comparison to their previous interview. When a person has some fear within themselves before the interview begins itself, they start getting nervous regarding the outcome of the interview which may have been the case for their previous job interview. So the person should lose the feeling of developing fear and nervousness as soon as possible so that they may not let it affect this interview. When it comes towards any kind of interview, the person who is interviewing always wants to see positive and good qualities within the person who wants the job and that’s exactly what the individual needs to show. So keep making the interviewer comfortable that the person can take on any kind of challenge which comes their way and show that they are reliable for working in the organization and they should realize it faster if it isn’t their first job interview. The first thing when it comes to body language that the person does when they enter the room is that they have a handshake with the person who is going to interview them. So the handshake needs to be firm and professional but not too firm causing pain during the handshake and also not too light handed. If it isn’t the first interview then the person should remember this and always ensure that they shake hands with their right hand. This technique refers to the person who comes for the interview looking how professionally the person interviewing them is sitting and also their posture. The person must look at the interviewer toward how their posture is and how they are maintaining their eye contact with the other. So in this interview they can mirror the other person showing that they agreeing in the way the interview is going on. When the job profile refers to more of discussion type then the person should think of using appropriate hand gestures whenever necessary at the time of the interview. Hand gestures really help in discussing their purpose of why they want a job in a much better way which even impresses the person interviewing them and they should think of using hand gestures when they go for another interview. When a person enters the room with a smile on their face and continues to maintain a smile for the rest of the interview in front of the interviewer, it immediately creates a positive environment in the room. This should be done if the person hadn’t done it before for their previous job interview and not show that they aren’t really interested in the job or the person taking the interview. If the person’s previous job interview hadn’t gone so well as they had planned about it there would be a reason that they weren’t so calm before and weren’t graceful during the interview. Things like rushing into the interview room and sitting aggressively when told to sit shouldn’t be done and they should easily perform it so that the interviewer knows that the person may be reliable to stay calm later on when any kind of situation arrives in the workplace no matter whatever the situation may be and find a solution to it quickly. Body language also comes into picture at the time the interview is over irrespective of the person getting or not getting the job. If things have gone wrong in the first interview then the person should realize that things like collecting all their belongings what they had brought along with them along with leaving the room with a smile on the face whether they got the job or not shows the interviewer that the level of professionalism still hasn’t left the person and shake their hand. So mostly when it comes to a first interview or a second one basically more or less the person should act in the same positive way and show their best positive side out to the interviewer. If there had been some negativity shown in their previous interviews the person should forget about it as soon as they can and overcome them so that they won’t repeat the same mistakes again in their next interview and maintain an appropriate body language for their next interview and be prepared.